A couple of years ago Vicka, one of the Medjugorje visionaries came to Dublin to speak at an event in the RDS. I went along because she is one of the reasons why I believe in what is taking place Medjugorje. I trust her sincerity, the radiance of her face. Her talk was followed by Mass and during the distribution of Holy Communion people surged forward towards where she was sitting on the stage, hundreds of hands stretching forward to touch her. To my surprise she herself came forward to touch the outstretched hands. My surprise was not that she responded to the need of the crowd but that all this was taking place immediately after receiving Jesus himself, while Communion was still being distributed. It showed that people didn't really understand what they had just received, who they had just received. I know, understand the need to touch, to be touched in order to be healed but in that moment I thought 'however gifted, impressive Vicka is, she is not Jesus. In him we have more than we have in her.' We have the more but we do not know it. 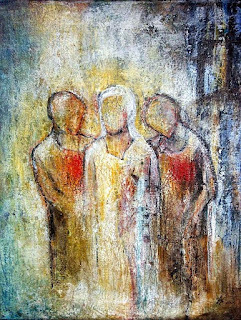 The same thought strikes me in relation to the woman with the haemorrhage in the gospel and I think in my own need for healing 'if only I could touch the hem of His garment...' And it dawns on me that in the Eucharist we have more than the hem of his garment. We have Jesus himself to touch, to be touched by him. To be healed by the source of all healing. The lament of Jesus over Jerusalem, his word to the woman at the well...his appeal to us "if you only understood who it is...if only you understood the message..." It is sad that we don't get it; sad that we suffer a spiritual and emotional haemorrhaging and we either don't realize it is happening or we look in the wrong places for healing. Sad that maybe we sometimes don't actually want to be healed because our suffering is a familiar companion and we don't know how to live without it. For the miracle to take place, for the daughter of Jairus to be restored to life, Jesus has to clear the house of all the commotion, confusion, unrestrained wailing, the doubt, the cynicism. Only people of faith can be present - the girls' parents and the three apostles Peter, James and John. For the miracle to take place we need somehow to arrive at a level of desperation in which we have no options left. Jairus, the synagogue official, would not have gone to Jesus except he was desperate for his daughter; the woman with the haemorrhage had gone through all the doctors and treatments and had nowhere else to turn. This desperation is like the rock-bottom place which is the beginning of recovery for the addict. This desperation is the birthplace of pure faith, the faith in which we are ready for healing. It is here that grace meets with our willingness, our readiness, our faith. In the awareness of my need for healing, in my place of desperation I reach out for Jesus himself and I clear my inner house of all those things that are obstacles to faith. I surrender my pain, my doubt, my cynicism and allow Him to do what he has come to do through His presence in the Eucharist. For you are my praise!